Right now I am 11 weeks and 4 days pregnant with hopefully my third take home baby. I’ve been dealing with a lot of spotting, rectal pressure, backache and fears of another miscarriage. But today I don’t want to talk about those things (gives me major writer’s block), I want to talk about what helps with morning sickness. So without further ado, I would love to share with you what’s working in the morning sickness department. As soon as I found out I was pregnant I cleaned “all the things”. This included the trash cans, the sinks, the microwave and the fridge… basically anything that would have the potential to stink and trigger vomiting. I really, really wanted to avoid vomiting. Ugh, I hate that sensation. Also, my husband and I did some “Once a Month Meals” freezer cooking and stocked up on the essentials. Yup, preparing for morning sickness is like preparing for the apocalypse. Or a hurricane. I won’t go into detail in this post about how or why this works (you can read this in my eBook), but I started taking three capsules of Jarrow’s Milk Thistle (Standardized Silymarin Extract 30:1 Ratio, 150 mg per Capsule) every day. For best results you would take this a few months before you conceive, but alas, I did not plan to get pregnant and was not taking this supplement prior to conception. However, I started taking it at 5 weeks with good results. I think this remedy, coupled with the others listed below have totally “taken the edge off” of morning sickness. In fact, this is the easiest first trimester I’ve ever had. No, the morning sickness is not gone, but I have only puked a few times and my biggest complaint is honestly fatigue. I’ll gladly take fatigue over morning sickness any day. This week I ran out of milk thistle pills (I ordered them last night, whew!) and didn’t buy more to see if I could tell a difference without taking the pills. Before I stopped I was feeling SO good. Like suspiciously good. So good I thought for sure I am going to miscarry. However, a few days after stopping the pills I started feeling terrible again and I puked up bile this morning. Looking forward to getting my milk thistle in the mail tomorrow. As soon as I started experiencing morning sickness I began taking the Unisom and B6 combo at night. Now, I’ve never taken these meds (let alone any meds!) 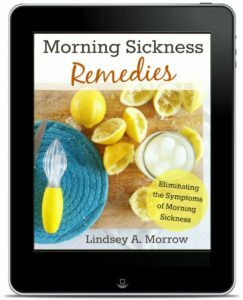 while pregnant and previous to writing my eBook I was extremely nervous about taking medications to help with morning sickness. After a little research I realized these meds are actually really safe (FDA Category A) and I decided it would be a good fit for me for a future pregnancy. Dosage: Before bed I take 1/2 a tablet or 12.5 mg of Unisom (also known as Doxylamine Succinate but better known as a nighttime sleep-aid) along with 25-50 mg of Vitamin B6. This was already in my prenatal vitamins so I only supplemented with a B Complex to round out my B vitamins. Starting this regimen has been a game changer for me. Not only did it fix my pregnancy insomnia (UGH!) but it “took the edge off” just like milk thistle did. I do think it makes me sleepier in the mornings but honestly, I’ll take it. Fatigue is so much better than nausea and vomiting. Unisom and B6 also comes in prescription form known as Diclegis or Diclectin. However, most insurance companies do not cover it because it is so “new” (it’s not new, but newly approved in the US). It’s really expensive if your insurance won’t cover it. The benefit of the prescription is that the medication is time released over the day so you will feel more “even”. However, since you likely can’t get it with a prescription just DIY it at your local drug store or amazon. After a few weeks of morning sickness, I noticed that my prenatal vitamins were becoming a trigger for me and swallowing them was tortuous. Happily, I found a gummy alternative and wow, what a difference! Removing triggers from my life has been so helpful. Now I actually look forward to taking my vitamin. Pre-gummy vitamin, as soon as I took the cap off I started feeling nauseous. Blerg. When faced with the yucky feelings of morning sickness I can understand why women would want to stay on the bed, couch… floor… or be put in a coma until it’s over. However, I found that by doing the exact opposite I was a way more functional human being and I felt better. Getting out of the house, going for walks, and generally staying active has helped a ton with me feeling better. Some of the worst memories I have with morning sickness (my pregnancy with my son) was when I was not getting out of bed and just SUFFERING. So, even though it feels oh so wrong, I hope you’ll get on your feet and keep moving. It has helped me immensely! Socializing, or for me working, has momentarily made my morning sickness symptoms disappear. When teaching my childbirth classes (or other similar work I do as a doula or childbirth instructor) I have felt my best. Isn’t that funny? I also felt awesomely similar whenever socializing, especially with new people. I chalk this up to adrenaline. I think adrenaline > morning sickness. Has anybody else noticed this? This was my most shocking discovery this pregnancy. Does this mean we should do adrenaline injections? Juuuust kidding. For those who don’t have extra help from friends and family… you are amazing. And I wish I could lend you a hand! I have to say, it has been so nice to be able to pass off certain duties to Matt that i’m either too tired to do or that just sound disgusting… like dishes, or the trash, or diaper duty, or opening the fridge. He doesn’t do it all the time but man, when he does I am so grateful! Keeping the kitchen clean, even when I don’t have the energy, is extremely helpful and wards off the yucky “first thing in the morning” triggers. At night, I try my best to clean the kitchen, do the dishes, and take out the trash. The following morning things are much easier for me to deal with. Channel The Fly Lady and shine your sink ‘errrrr day! Toddler poop is disgusting. And though my husband has been extremely helpful even he, has limits. That is why we decided to start using disposable diapers during this time of heightened smell and being gag happy. I am so happy we did this! Sure, some may say this is a great motivation to potty train my almost two year old. Yeah, shut up. I don’t want to deal with poop and pee messes because it will inevitably become poop, pee and vomiting messes. And seriously? I’m in survival mode not super mom mode. I love disposable diapers and they love me. We’ve all heard this before, but it is true and deserves repeating. It’s important to stay on top of eating and drinking throughout the day, hour by hour, minute by minute. The times I have felt the worst, and struggled to get back to feeling well again was when I spaced my meals or snacks out too far. Not keeping up with this can put you into a cyclic vomiting cycle which should be avoided like the plague. Or Ebola. Catch my drift? Take this seriously. Getting hungry is not good, even though food seems like your enemy. My advice? Eat anything that sounds good, even if it is junk food. Not long after that start to eat something – like a small meal. Priming my stomach with soda, or crackers or SOMETHING that sounded good made eating in the future much easier. Also, staying hydrated will help keep nausea away. Make sure you’re drinking enough water to sustain a pregnant lady. Keep your water bottle on you at all times and you won’t forget to keep drinking! Preggie Pops and citrus essential oils won’t make morning sickness go away. However, they are an EXCELLENT tool to use in the moments where you think you might “lose it”. When I didn’t have snacks in my purse and knew it would be a few minutes before I could get food, sucking on a Preggie Pop or sniffing essential oils gave me a few more minutes. If I didn’t have either of these options I’m pretty sure I would have puked. Since there’s a woman on the front of the packaging I have successfully been able to keep them away from my kids by telling them they are only for mommies. Winning! This is all great advice and I am pinning this for later. I love your honesty and humor and am so happy this pregnancy has been better for you!